Hook Module up to a decent MIDI keyboard and you have a genuine performance instrument that any skilled player would have a ball with. Great as a live performance instrument. Effects sound good. Very limited as a production tool. No MIDI controller support beyond keyboard input. 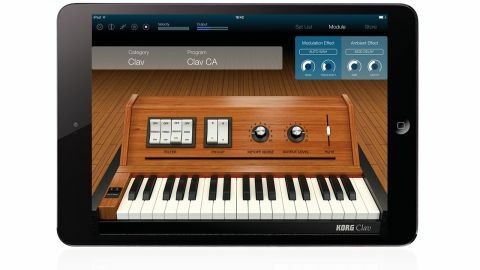 Korg's latest iPad app is a virtual sound module aimed first and foremost at keyboard players. Weighing in at 1.3GB, it features five sample-powered engines, covering all traditional 'keyboard' bases: Acoustic Piano, Electric Piano, Organ, Clav and Multi. The first four are self-explanatory, while Multi delivers (sampled) synth sounds, including strings and brass. 100 presets are included, and two IAPs are available: Synthogy's Ivory Mobile Grand piano, improving on the quality of the standard equivalent, and the Wurley Electric Piano, which adds 118MB of Wurlitzer samples to the EP engine. "It nails its primary role as a live performance instrument, delivering a wide range of authentic keyboard sounds"
Each engine hosts a set of core tonal variations (eg, Tine Soft, Tine Hard, Digital EP, etc, for Electric Piano) and its own array of editable parameters. These include the likes of Rotation and Overdrive for Organ, Low/Mid/High tone controls and Release Time for Acoustic Piano, and a variety of sound style-appropriate controls for Multi (Filter Cutoff/Resonance, Mod Rate/Depth, etc). Two multi-effects processors are onboard, too. The misleadingly named Modulation includes distortions, EQs, filters and compression, as well as phaser, chorus, tremolo, etc, and Ambience takes care of delay and reverb. Each effect has two contextual controls, and they all sound good - it's just a pity you can only use two of them at once. Other features include a music player with access to your iPad's Music library; the Set List, enabling you to build a list of presets and associated music tracks for organised gigging; a PDF/image viewer for displaying scores; an audio recorder with SoundCloud, Dropbox and Mail sharing; a MIDI file player; and AudioBus and IAA compatibility. Module's five modules also appear in Korg's Gadget, if it's installed, although their sample library has to be copied over to it, requiring another 1GB of space. As a production tool, Module is very limited: Multi's 18-strong library of waveforms is decidedly cheesy (seriously, synth brass, in this day and age?) and there's no meaningful editing to be had. However, it nails its primary role as a live performance instrument, delivering a wide range of authentic keyboard sounds, playing beautifully, and stumbling only in the surprising omission of MIDI controller support beyond standard keyboard input.